Write some words with contractions on index cards and have your child sort them by word group; for example, "not," "is," and so on. When teaching contractions, make sure to chart them by their word group: for example "not," "is," and so on. Kids write the two words that make up each contraction on this second grade reading and writing worksheet. 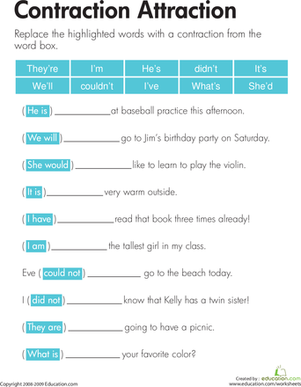 On this second grade reading and writing worksheet, kids complete sentences by replacing two words with a matching contraction from the word box. Help your child ease into grammar with a quick look at contractions: words formed by leaving out and combining sounds in a phrase. Is your kid having trouble with contractions? 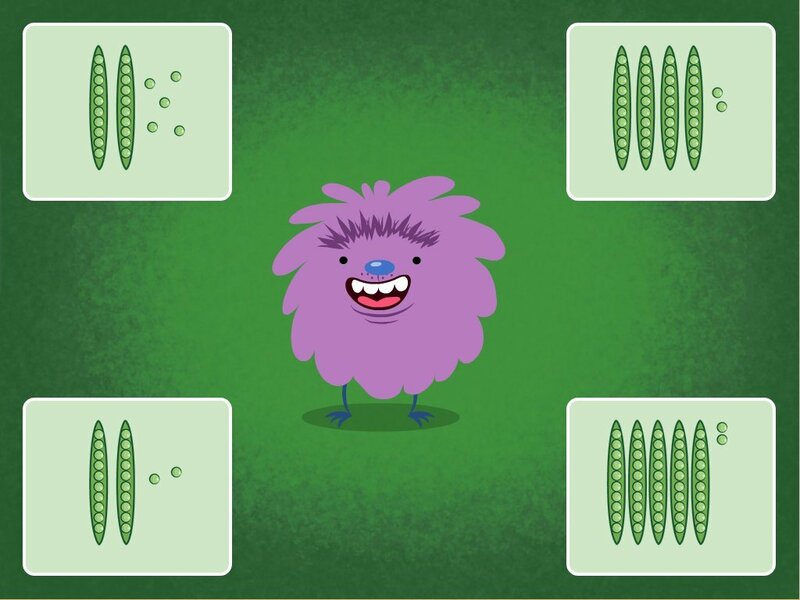 Try out this simple memory matching game. 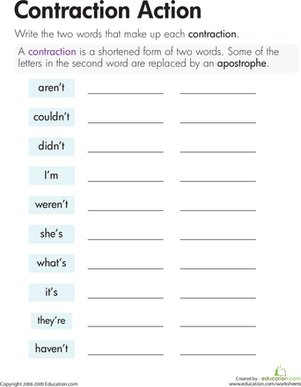 Get a grasp on contractions with this helpful practice sheet! Your child will be building useful grammar and punctuation skills as he goes. Have a hundreds chart on hand to help your child practice building numbers by adding 10 more or 10 less. Be sure to teach your students how to use a number chart. Have them use manipulatives to build and create numbers. 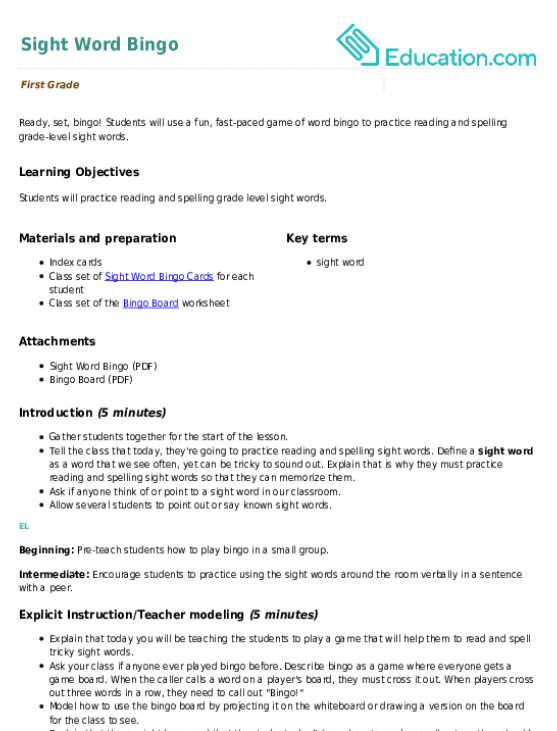 This math and patterns worksheet features a chart with the numbers 1 through 100 to help your kid learn how to identify patterns and review place values. 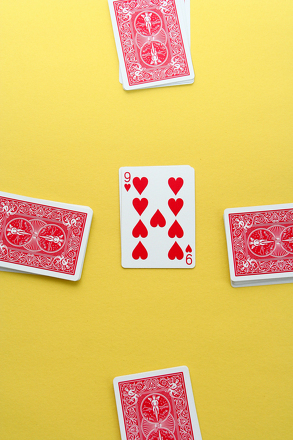 This activity is based on the popular card game, Slapjack. It's rip-roaring fun, and it reinforces the concepts of odd and even. 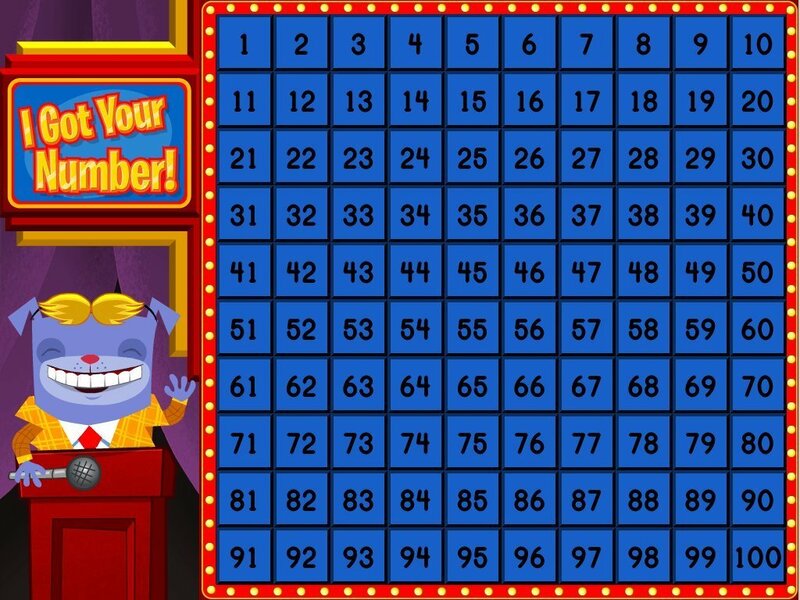 Kids practice adding and taking away 10 in this silly game show. This expanded form worksheet gets your child to break down numbers by ones and tens. This expanded form worksheet is an easy introduction to place value. Pass the peas! Kids identify two-digit numbers based on tens and ones. 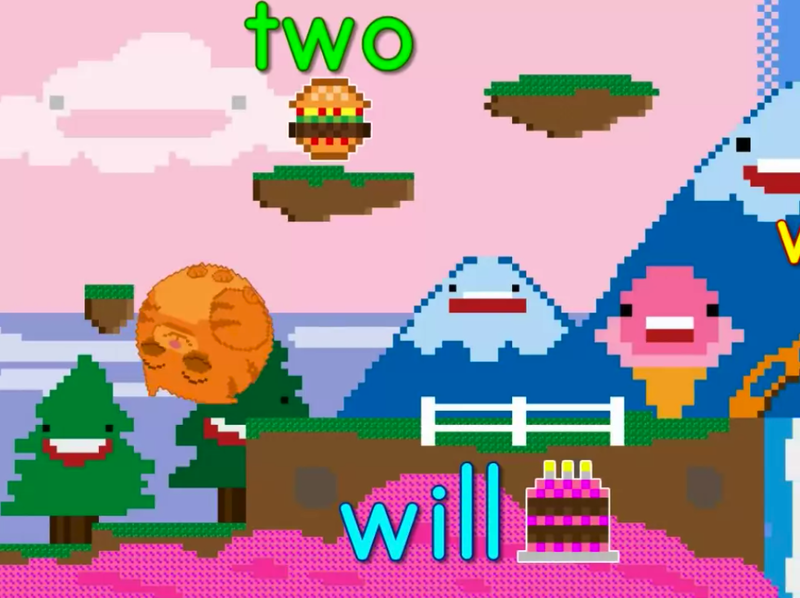 Help Roly munch the right words in this exciting sight words game! First graders should end the year knowing at least 100 sight words. This will give them more reading stamina and fluency. Combining writing and sight word practice, this complete-the-sentence worksheet is packed with learning. 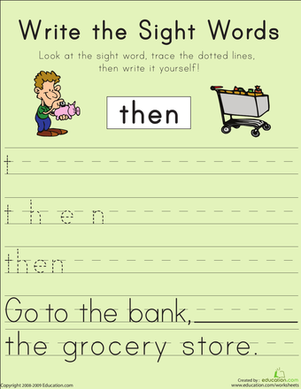 Write the Sight Words: "Then"
Help your child learn the sight word "then" with this printable phonics worksheet. 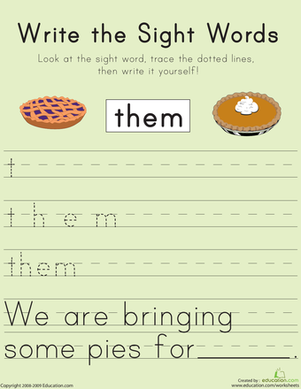 Write the Sight Words: "Them"
Help your child learn the sight word "them" with this printable phonics worksheet. 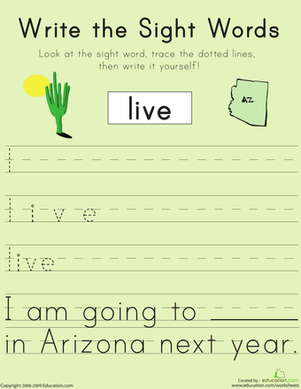 Write the Sight Words: "Live"
Help your child learn the sight word "live" with this printable writing worksheet. 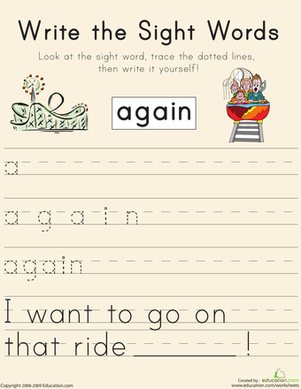 Write the Sight Words: "Again"
Looking for a phonics worksheet to help your child with sight words? This printable will give him practice with the word "again". Ready, set, bingo! Students will use a fun, fast-paced game of word bingo to practice reading and spelling grade-level sight words. Use this fun games-inspired lesson plan to review or preview sight words with your ELs as they practice reading and spelling high frequency words. This can be used as a stand-alone or support lesson for the Sight Word Bingo lesson plan. When discussing opinions with your child, make sure to highlight the difference between a fact and an opinion. When discussing opinions, make sure to highlight the difference between a fact and an opinion. Write some facts and opinions on sentence strips. Read them aloud, then have students sort them. Before students write opinion pieces, they need to understand the difference between facts and opinions. This worksheet teaches them to do just that by having students cut out various statements and sort them into fact and opinion categories. Are your students getting ready to write their own opinion pieces? Set students up for success with this worksheet that will have them record and differentiate facts and opinions about a topic of their choice. 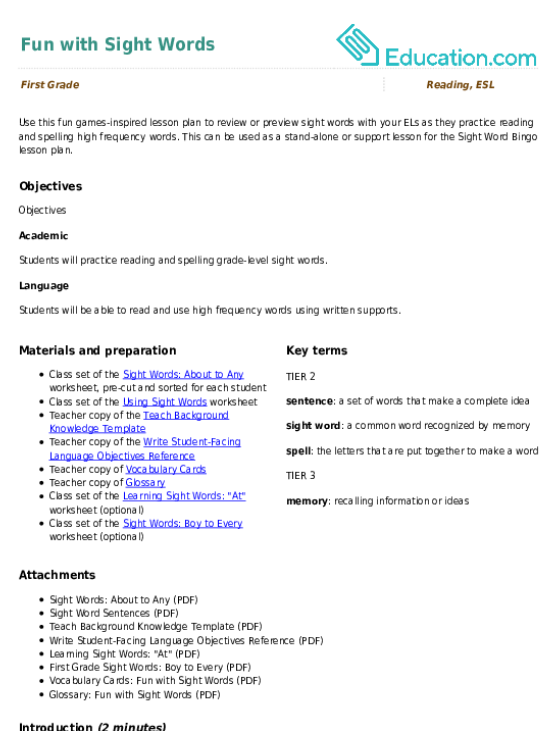 Help your students prepare to write an argumentative piece with this writing prompt activity. This worksheet will jumpstart the writing process by having students articulate an opinion and come up with supporting evidence and details. 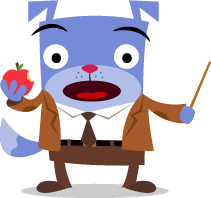 Engage your students in argumentative writing by having them share an opinion on a topic that may be near and dear (or not so dear!) to their hearts—homework! Engage your students in argumentative writing by having them share an opinion on a topic that may elicit diverse feelings—pet snakes! Students will use this writing prompt to practice writing an argumentative paragraph using supporting evidence. Quickly assess each student's level across key skills for first grade. Designed by our expert educators, our assessment packet makes it easy to help every child catch up, learn more, and get ahead. Get a clear sense of where your little one needs an extra boost and where they're already excelling. 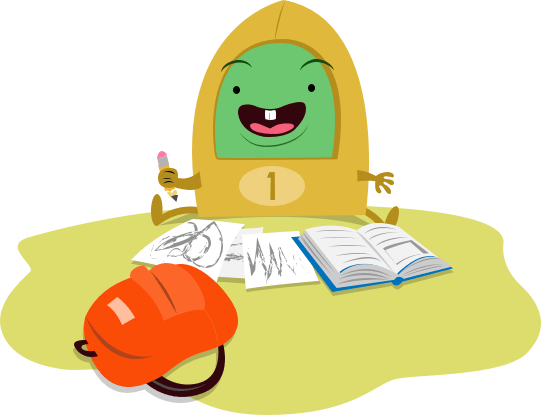 Designed by our expert educators, our assessment packet makes it easy to help your child catch up, learn more, and get ahead. Send this week's free resources to help reinforce the skills you're teaching in the classroom. Send home these fun free resources to help reinforce the skills you're teaching in the classroom.